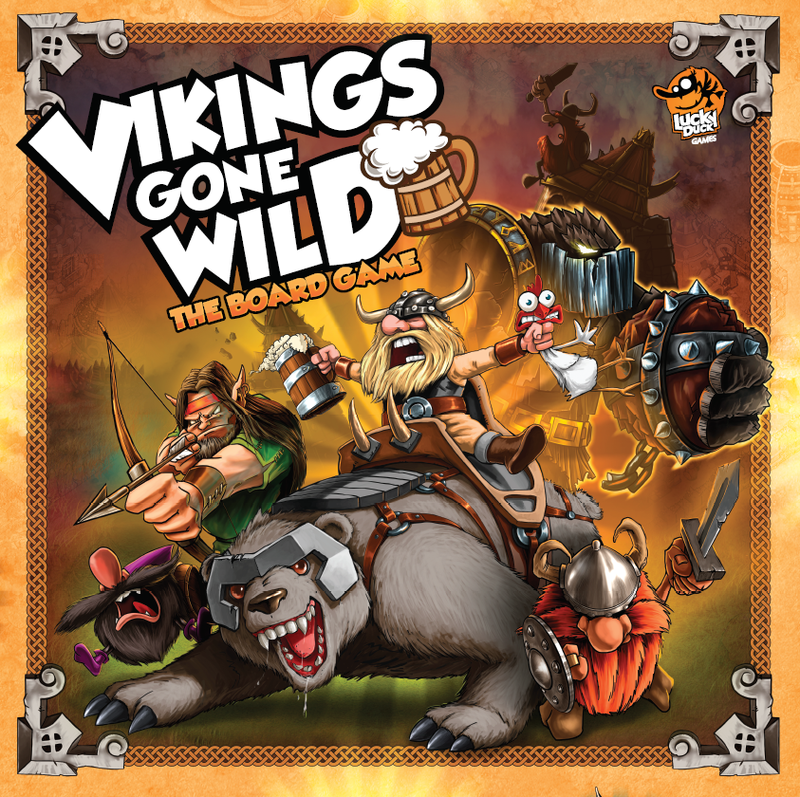 Vikings Gone Wild is a game by Julien Vergonjeanne, published by Lucky Duck Games. It is for 2-4 players. In this game, players take on the role of the heads of a Viking clan. They will be attacking their fellow vikings, building up their village and it’s army and completing mission as they try to impress their gods and gain victory points. Of course they’ll have to be able to defend themselves and their village as well. In the end, the clan that can prove they’re the best vikings by collecting the most victory points will be declared the winner. To begin, the board is placed in the middle of the play area. Each player takes a helper card as reference and a player board which they will then place it in front of themselves. They then pick 2 matching player tokens. The smaller one is placed on the starting position of the scoring track, while the larger one is placed on the flag space on the player’s board. Players each get 3 Town Hall cards, one for each level 1-3. These are placed in numerical order with the level 1 card on the top. The stack is then placed in the player’s Village area beside their player board. The Mission cards are separated into 2 separate piles; 1 with the 1 victory point missions and the other with the 2 and 3 victory point missions. The piles are then shuffled separately. Players are then given 2 random missions from the 1 victory point pile which they then place on their player board face up. The stack of 1 point victory point mission cards are then placed on top of the stack of 2 and 3 point victory point mission cards. The deck is then placed face down beside the board within reach of all players. Players are now given a starting deck consisting of 6 beer cards, 2 gold cards and 2 viking warrior cards. They shuffle their starting deck and place it face down on their player board. The Unit, Defense and Building cards are separated into individual stacks and are then placed on their corresponding spaces on the board. The Odin’s Path cards are shuffled together and placed face down on their space at the top of the board. The top 5 cards are drawn and placed in the corresponding spaces of the Odin’s track. Three random Divine Favor cards for each player are taken from the Divine Favor deck. The rest of these cards are returned to the box, not to be used during the game. The chosen cards are then shuffled together and placed on it’s assigned spot on the board. The top 2 cards are then drawn and placed to the right of the deck on the board. The End Game Bonus cards are shuffled together. The top 4 cards are drawn and placed on their spaces on the board. The remaining cards are returned to the box. The Construction/Damage tokens, along with the beer barrels and gold bars are placed in separate piles within reach of all players. The first player is chosen and is given the first player token. Play now begins. The game is played over several rounds. Each round is divided into 5 phases; production phase, drawing phase, players phase, storage phase and round end phase. The first phase is the Production phase. In this phase, each player places a beer barrel on each brewery they have in their village. They also place a gold bar on each gold factory they have in their village. The next phase is the Drawing phase. In this phase, each player draws 5 cards from their deck. If they have a tavern in their village, they’re allowed to draw an extra card. If they have a Drakkar in their village, they are allowed to keep a card in their hand from the previous round. This card does not count against the player’s hand limit. The third phase is the player’s phase. This is where all the action happens. In this phase, each player in turn order will take their turn. On their turn, they’re allowed to take any number of actions that they can and that they chose to take in any order. There are 6 different types of actions available; buy units, defenses or Odin’s path cards, buy buildings, upgrade the Town Hall, attack, complete a mission and exchange resources. Buying units, defenses or Odin’s path cards may be done as long as the player has the resources to pay for them. Each of these card types have either a price in gold, beer or both. Players may use the cards from their hands to pay these prices or they can use the beer barrels and gold bars from their buildings and containers. They can even use a combination of both. Once a card is purchased it is placed in the player’s area along with the rest of the cards the player has played during their turn. It should be noted that later on when storing beer and gold, only beer barrels and gold bars may be stored. Gold and beer from cards may not be stored. Just something to keep in mind when purchasing cards. Also of note, when a player purchases a card from Odin’s path. All the cards to the left of the purchased card now move to the right to fill in the empty space. A new card is drawn and placed in the leftmost empty space once this is done. Buying buildings is done much like purchasing any of the other cards. They are paid for the same way with either a beer, gold or both resources cost. However, when a building is bought, it is placed in the player’s Village area where it will stay for the rest of the game. A player is only allowed to have 3 of the same type of building and may only build buildings as their Town Hall allows. When the building is purchased, it is placed in the player’s Village with a construction token placed on it. This shows that the building may not be used or attacked during that round. It should be noted that a player is allowed to return 1 of their buildings back to the supply if they so desire. However they gain no bonuses or reimbursement from doing so. Upgrading the Town Hall allows a player to add more buildings to their village. A level 1 town hall will only allow for 3 buildings not including the town hall. A level 2 town hall allows for 6 buildings not including the town hall. A level 3 town hall allows a player to build as many buildings as they would like but still retains the 3 of each type rule. When the player upgrades their town hall to level 3, they immediately gain 5 victory points. To upgrade their town hall, the player must pay the cost in gold. Attacking can be done against another player, an undead or the Draco. To make a successful attack against another player, the combined strength value of all the attacking units must be greater than or equal to the defense value of the building targeted. A player is only allowed 1 attack per player per turn and players that have already been attacked by other players can’t be attacked again during this round. A player may use as many heroes or units as they would like to attack a single building. If the attack is successful, then the player places a damage token on the building. This allows the player to count victory points and indicates that the building can’t be attacked again that round. It should be noted that a player may defend their buildings against attack, as long as they have a defense card in their hand. They simply play it when their buildings are targeted and the defense card raises the defense value of the building under attack. If the defense value ends up being more than the attack value, the defense succeeds. Players earn victory points for successfully attacking buildings or for defending. For more information on the victory point rewards, please check the rulebook. The player can instead choose to attack an undead or the Draco. To do this, the player chooses an unded among the Odin’s Path cards or the Dracon on the board. Just like attacking another player, the combined attack value must be more than or equal to the defense value of the undead or Draco’s defense. Undead reward the player with a resource displayed on the card and a victory point, while the Draco rewards a resource of the player’s choice. To complete a mission, the player must meet all the requirements of one of the Mission cards on their player board. The player simply announces they’re fulfilling a mission and then they receive the victory points written on the card. The accomplished mission is then placed facedown on the Mission Successful spot on their player board. A player is only allowed to complete 1 mission per round. During the drawing phase, if a player has only 1 mission card face up on their board, they will then draw a new one. The final action is to exchange resources. To do this, the player has to exchange 2 identical resources to gain a resource of the other type. This can be done as many times as the player has resources to swap. The next phase is the storage phase. In this phase, players are allowed to move any of their unused produced resources to their containers. They can also move stored resources to another container for that resource. If the player doesn’t have any containers for the resource, it is discarded. The player is not allowed to keep resources unless they have a corresponding container for it. It should be noted that if a player has 4 identical resources stored in a container, they gain a victory point. The final phase is the round end phase. In this phase, several things happen. Each player must discard all the cards that they played during the round. They also discard any cards left in their hand, unless they have a Drakkar, which allows them to keep a card. Construction and damage tokens are removed from buildings. The Odin’s Path card on the right most space is discarded and all the cards along the path are moved to the right. A new card is then drawn and placed in the empty spot. The first player token is passed to the next player in turn order. A new round then begins. The game continues until a player reaches a certain amount of victory points. Whenever that happens, the current round becomes the last round. Players finish their turns like normal. Once the game ends, scoring occurs. Players check to see who fulfilled the conditions of the bonus cards. Victory points are then handed out for each one. Players then check their victory point total and the one with the most victory points is the winner. One thing that I didn’t mention is the Divine Favor cards. These can not be bought but must be earned either by attacking a level 3 town hall or reaching a certain number of victory points (5, 12 and 20). The player flips the top divine favor card over and chooses between it and the 2 face up cards. The chosen card is placed in the player’s area and the two that remain are placed in the two spots on the board. There are so many great looking pieces that come with this game. There’s the board with spaces for everything including a nice looking scoring track and a gruesome looking Draco on it. There’s even a conversion rate for exchanging resources as well. Next there are the player tokens in large and small sizes with some really amazing looking character artwork on them. There’s also the double sided tokens with construction hammers on one side and damage explosions on the other. These as well as the player tokens are all thick cardboard. Next we have the wooden pieces, the gold bars and the beer barrels. These are great and look just like the resources they represent. The gold bars can be a bit difficult to pick up sometimes if you try picking them up from the side. However the look and feel of these are great. There are the player boards which are a bit thinner than the cardboard pieces but should be too big of a deal. I do wish these had been made of the same thick cardboard as the tokens though. Next there are all the beautiful looking cards. There are 10 different types of cards and each one looks great. I especially like all the various unit and character cards throughout the different card types. The reference cards are great and are very helpful when playing the game. Finally there is the first player token that is a stand up of Mjolnir, Thor’s hammer. What game about Vikings would be complete without that? Like I said, there’s a ton of stuff here. Each piece fits the theme perfectly and has that humorous viking tone to it. I absolutely LOVE how nice this game looks. It’s as close to perfect as you can get without miniatures. The rulebook for this game is extremely nice. There are lots of great looking pictures and examples throughout the book. There’s even a nice setup picture to show you how the game should look. Each phase of the game is explained in great detail and in a very easy to understand way. There are several pages devoted to explaining the different card types and what each icon means on them, including pictures. The rules also have a nice faq section to answer any nagging questions you might have. I didn’t see anything that was difficult or hard to read. Everything looked great. This has got to be one of the best looking rule books that I’ve seen this year. Overall, there’s nothing I’d have done any different. As I’ve mentioned numerous times before, I love deck building games. I have to say that this is probably the most unique and different deck building style game that I’ve ever played. It has some of the hallmarks of a normal deck builder. For instance, you have a bank of different types of cards that you can purchase like in Dominion or Tanto Cuore. However there’s also an ever changing line of cards that you can buy such as in the DC deck building game or Ascension. All that makes for a pretty interesting game, but that’s not all that this game has going for it. You also have a bit of tableau or city building with your village area that can produce resources. Combine all that stuff together and you have a pretty cool game. My first play through, I focused mainly on getting buildings built to create resources and to have places to store them. Needless to say my opponent was stocking up on units to attack those newly built buildings with. Let’s just say that the game didn’t go my way that time. I learned rather quickly that you really have to do this kind of balancing act. You need those resources to buy stuff with but you also need to be able to attack and defend or you’ll get left in the dust when it comes to earning victory points. I’ve found that the best variety of things you can buy comes from the Odin’s Path cards and the Divine Favor. You can find a lot of good stuff that will really come in handy or that will bump you up faster on the victory point track in the Odin’s Path cards. However, the Divine Favor cards will supercharge your deck with lots of really powerful cards. There’s mighty heroes that can amp up your attacks or even help defend your village. You really want to pay attention to what’s available in both these areas. For a deck building game, this one has quite a bit of player interaction, more than what I expected. That’s not a bad thing. It’s just different from your average deck builders. Thematically this game is quite fun. The artwork lends itself to this fun and humorous style theme quite nicely. I have to say that I like this one. Fans of deck builders should really check this one out, they will most likely enjoy it, especially if they like a little player interaction mixed in. Overall, it’s a pretty good game. I recommend it. It’s got a lot to like about it. 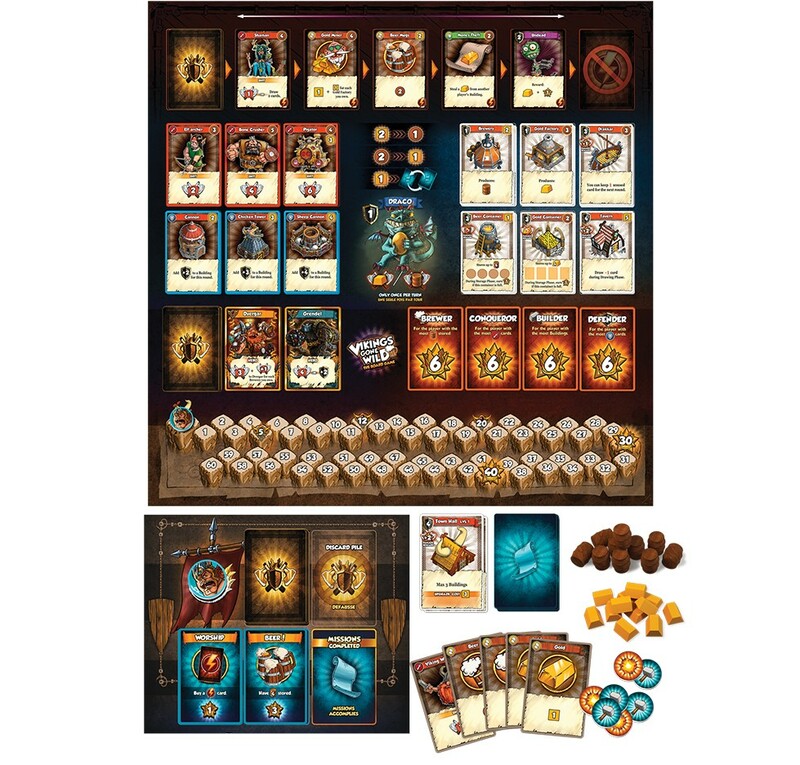 Vikings Gone Wild is a deck building game that combines lots of different styles together into a really unique experience. The game doesn’t take an extremely long time to play. Most game sessions last around 45 minutes to an hour. The components are really amazing looking. I especially like the humorous style artwork and the wooden beer barrels and gold bars. Thematically the game looks and feels great. The game is quite fun and has a really unique take on the deck building mechanic. It combines aspects from Dominion and Ascension as well as adding in healthy dose of player interaction along with some city building and resource management. For me there’s just so many good things to like about this game. Fans of deck building games should really enjoy this one. Overall this game looks and feels like a wild fun ride. I would recommend it. You will most definitely want to play it again and again. For more information about this and other great games, please check out Lucky Duck Games at their site. This entry was posted in Reviews and tagged board, board games, card, card games, duck, games, gone, julien, Julien Vergonjeanne, lucky, lucky duck games, vergonjeanne, vikings, vikings gone wild, wild. Bookmark the permalink.